This blog has been a bit quiet recently, but there’s a reason for that. Along with countless others, I emerged from National Novel Writing Month on 30th November, having just about snatched victory from the jaws of defeat. I hit the requisite 50K words on 25th November, but I’m still feeling a bit shell-shocked. This year’s go at NaNo was nothing like as straightforward as my previous attempt, The House at Zaronza, in 2012. Then, I had the story all laid out and, while I changed bits as I went along, it almost wrote itself. The birth of the latest oeuvre was somewhat more fraught. One of the reasons was that I was still agonising over which of my two ideas I should write as we approached the starting grid on 1st November. One was a sequel to The House at Zaronza set in World War II; the other was a sort of prequel, set in 18th-century Corsica. Then I read some good advice in Writing Magazine, which was to write the one that keeps nagging at you. At least you then have it out of your system even if you don’t go anywhere with it. I took that advice and wrote the prequel, which was the one I thought about before going to sleep at night and on waking in the morning. It wouldn’t leave me alone. The problem was that I didn’t plan it out as well as I should have done beforehand, because I had been juggling the two ideas for too long, which meant more improvising as I went along. I even have three working titles for it and can’t decide on the right one. Why did I do NaNo, then? Simple. I am a serial procrastinator and without that discipline I would still be on page 1. At times, I had to force myself to write even when I didn’t want to. But the result is 5/8 of a novel. Sure, it needs finishing, rewriting, Beta-reading, editing, polishing, etc., and I need to do more historical research, so I’m a long way from the finish line in reality. Even so, I have the satisfaction of having something to work with. For December, though, I’m going to take another piece of advice, which is to leave my NaNo novel alone and let it settle. Hopefully, my subconscious will continue to work on some of the knotty plotting issues during that time. Instead, I’ll focus on some short stories I want to write. The Zaronza sequel is next in line. In the meantime, watch this space for more news of the three-working-titles prequel. What was your experience of NaNo this year? This entry was posted in Historical Fiction, Novels and tagged Corsica, historical fiction, historical novel, National Novel Writing Month, The House at Zaronza, writing by nessafrance. Bookmark the permalink. Gosh, well done! You’re almost there. I really need the discipline of NaNo to get it down, but of course it needs a lot of editing afterwards. I’m going to leave mine until the Xmas break and then finish it. Never mind about the house – that can wait till 2016! I had more of a plan than in previous years and largely managed to stick to it! I too am taking a break this month, although I always miss the characters I have created after finishing Nano. I wonder what they are getting up to without me! Well done with writing the prequel to THAZ. I look forward to reading it. And short stories on my to do list too! Well done, Susan. Like you, I also miss my characters but I’m sure they are still living their lives in my subconscious, ready to pop out again after Christmas. I think taking a break is a good idea. NaNo itself is so intensive that you can’t sustain it for longer than 30 days. Didn’t we do well! I was also proud to reach 50,000 words on 30th November with two-and-a-half hours to spare. I also didn’t plan enough and, because I felt stuck with my novel after 20,000 words, I went on to my other idea, so now I have something to start working on for both of them. The many local write-ins made November a wonderful month. We’re all missing it now. Well done for getting to the 50K. And you have at least two things to continue working on! I could do with another dollop of NaNo to get this one finished. 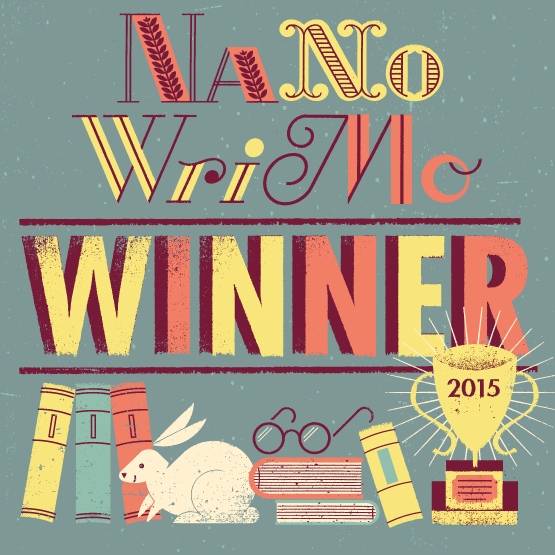 Who else did NaNo this year? Here are my post-mortem thoughts.